Folks if you like this type of Citizen Sleuthing and Reporting, sign up as a follower on the right, and do a share on Facebook, twitter, everything you got, even do the Google G+1. Thank You very much. 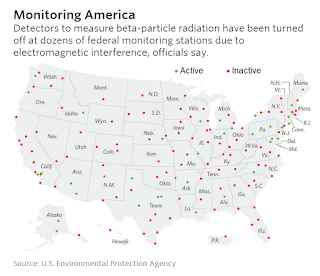 “We can confidently say that this system is fully capable now and fully operational now with the current monitors it has to detect fairly minute levels of radiation,” said Jonathan Edwards, director of the EPA’s radiation protection division. stock here: Really Jonathan, even though it is half broke? Without the Beta detection? And we want near real time data....we refuse to rely on your promised "alternate" data, you stated as once a week reports from air filter samples---- that would also be hid when the strontium shows up. Indeed, we want it to be harder for you to lie, i.e. we want the real time data that you have the ability to deliver. So mr. Jonathon Edwards, in fact your own (EPA) report from 2012 indicated how important the Beta detectors are. 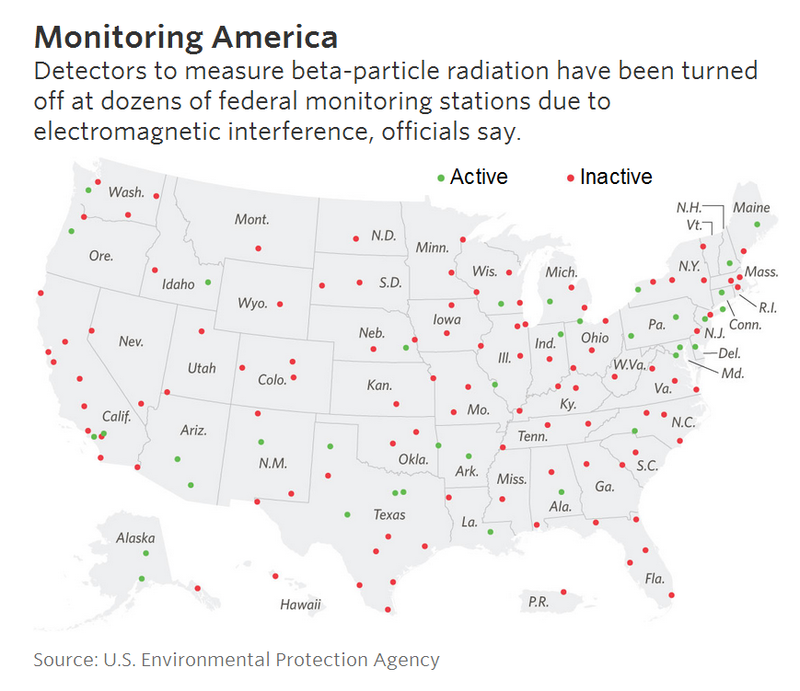 Environmental Protection Agency officials confirmed 99 of 135 beta-radiation sensors in its RadNet system—which monitors in all 50 states, the District of Columbia and Puerto Rico—aren’t working and have been turned off. Officials blame electromagnetic interference from sources such as cellphone towers and said efforts to resolve the problem have been unsuccessful. The EPA said the move was a cost-saving measure and that remaining radiological resources in Western states are sufficient to deal with emergencies. Really? The task of radiation monitoring is very automated, for doing all the Gamma and Beta in the USA it is less than $2M per year. So for the Beta it's around $1M per year, or 0.3 cents per person. Or look at it this way....to monitor all the Beta in the USA is 0.01% of their agency budget. The annual cost of up to $2 million to operate the fixed monitoring system is a fraction of the EPA’s 2015 budget of $8.1 billion. The EPA is outright failing us. They are no longer protecting us, they are captured. In addition, the EPA last year discontinued a part of its RadNet system that tested milk from dairies for radiation. The agency said the task would be handled by the Food and Drug Administration, which for years has also had a milk-sampling program. The agency can compensate for the lack of real-time beta data, officials said, by relying on each RadNet station’s gamma-radiation monitor, which hasn’t been affected by the interference. Almost all radionuclides that emit beta particles also emit gamma radiation, they said. 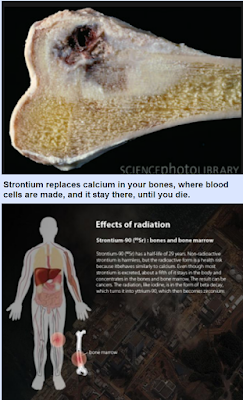 Both types of radiation can cause cancer. True that, but if the EPA doesn't like the test results from the once or twice a week airfilter data, they will just delete them. And the reality is that for normal people, aka citizen scientists, parsing through the EPA database is a nightmare. It takes 2 minutes just to download a set of 400 data points, and those only cover like 2 weeks. It would be a full time job to do this for all 135 sites. And then a complicated assembly process to put the data into excel and combine it, and graph it. In other words, the EPA has effectively made it impossible for anyone not operating under grant money to be able to make sense of the "publicly available data"
But they don't know that we have citizen scientists who are hawking this closely. First, Nukepro (that's me) starting posting up all of the nationwide charts all in one easy to review, easy to scroll through web page. See link below, this was on AUGUST 20,2015, I set up an easy way to scroll through ALL of the readings in Beta and Gamma at one page on my site. 3 days later they completely move all of the data sources around, scuttling my efforts and requiring a complete reprogramming. Sorry, I did not have time to do the work over again. 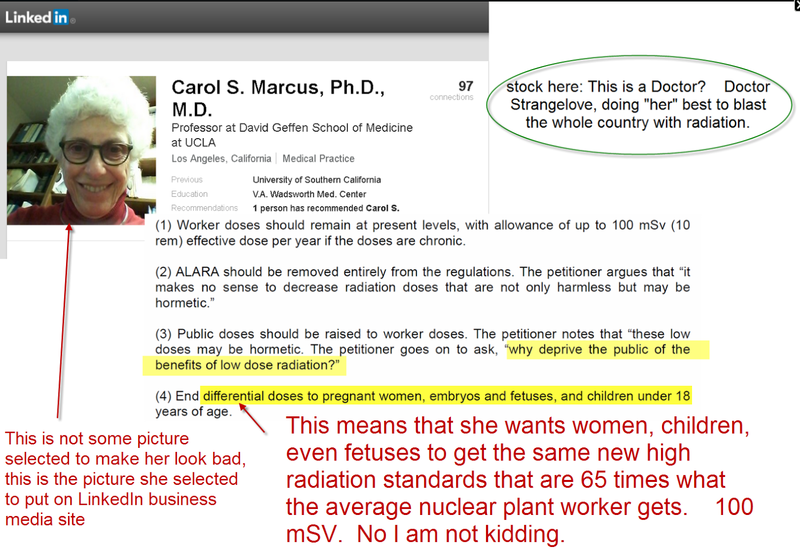 They blame the problem not on the radiation monitors themselves, but on cell phone towers. Like there weren't cell phone towers when things were working pretty well prior to Fukushima. 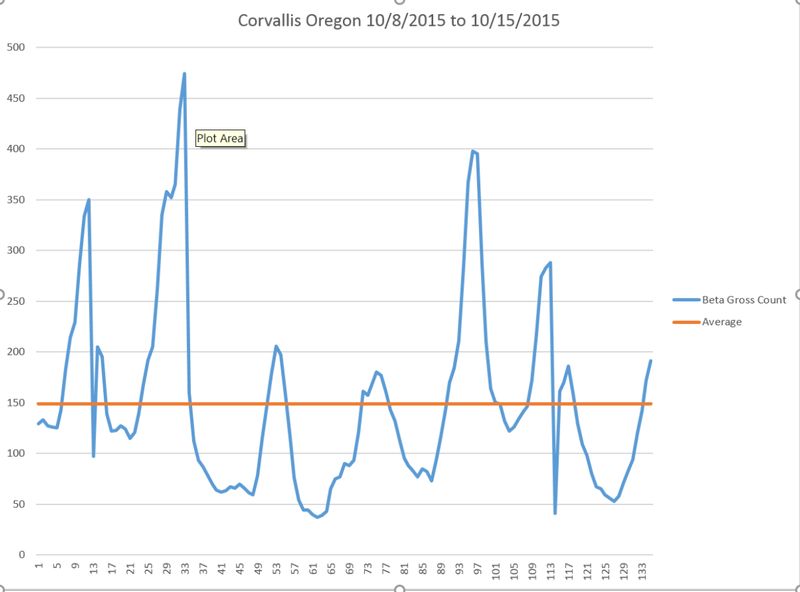 Then a fellow citizen scientist, screen name pinksailmatt, who contributed a massive Excel sheet in which he has been downloading the EPA data for his location Corvalis Oregon, and compiling in the tedious way I mentioned. Aiyaiyai! He has caught the EPA at their game, but it is a bittersweet victory, since his formerly beautiful Oregon is being BLASTED with Beta and Gamma radiation. During this time, and on some of the later pool plume events...it appears that some of their measuring instruments might of had trouble handling the high radiation levels, as the graphs started looking pretty weird esp for the temperature. At times the complete data set just vanished. That was probably done on purpose...the bastards. But it does give some very important info if you look close at it. I put some notes on the data set describing what I saw that was relevant. I wonder how high a dose it takes to eff up a standard temperature probe? Clues! If you want his email direct, I can give it to you, but I will have to ask him first. If you think the EPA is the only "Captured" Regulatory agency, turn your gaze to the NRC, who is trying to protect the nuclear cartel by lowering their costs, by letting them release 100 times more radiation on us. I know it is hard to believe, but it is true, they have $400B a year industry at risk. That means a lot more to them than your life. While all this is going on, the NRC is promoting an "enquiry" from a total of 3 people who have a very vested interest in using "radiation" to make themselves wealthy, for a disgusting promotion that "radiation is good for you" aka Hormesis. The regulatory agencies have been totally captured, we cannot trust them at all. They are taking public comments now, and in all likelihood this will turn this into a TRAGIC ruling to allow 100 times more radiation to the public. 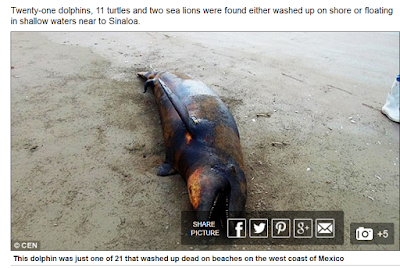 And just today, the first published mass die off from Mexico. This other article details 61 pages of just HEADLINES showing the progression of damage to the Pacific post Fukushima. OK a simple fix, we all have Beta testes for outside air sampling which would be the air-filter in your car. EPA would freak-out if we all mailed or filters to them! But for ourselves this is a good source for annalist. I like that, but you would probably get a citation for mailing radioactive material, lol, almost not joking. Sheesh, I had my "rad lab" properly set up with gamma scint, I could be testing these. Oh well, sometimes life gets in the way of great ideas. You know your right about the hazmat and then how to dispose of it$ The interest from the public would be high but with many individuals with geiger counters today to do readings and share those tests. Then post the results, life is affordable. Would this be possible? I could help with that and the work load, we could sure use the results right about now. Ya Mark, a simple experimental design take one after the other, or side by side readings with the same model Geiger of the same sample. On one Geiger, place a lead sheet between Geiger and sample, that will knock out all the alpha and beta, giving you just Gamma. Instead of lead you could use aluminum or even plastic, research thicknesses. note that an inch of lead will mitigate about half the average Gamma. Do one more test, using just a sheet of paper to stop all alpha, but let most of the beta through. OK now you have a pretty good idea of what the Beta count is. Thanks Mate, appreciate your time on this. I feel as this evolves where the public can wrap their head around this science will force us to do something instead of worrying, we worry because we don't understand the fix. A new science Stock, 'The Balance' we're in this together which will bring more value. I'm going to create a new page on one of my sites where this will be launched. Your site will be recommended there if that's good with you. Moving foreword you have any questions on web design I can help, glad to do it. Just Google rightwiththeship that's me Stock and good having you out here. I hope many of your readers will see this comment thread, the simpler the better. Ya Mark, i put you in my "real people" anti nuker file. So you may hear from me on web works. Also I agree that information needs to be simple enough, but no simpler, and ACTIONABLE. Of course go ahead and link here as often as possible. My first comment in the thread, testes, really? tests- then the word or between mailed and filter should read our. My typo, I contacted Blogger and we might see an editing tool for the comment section, ah that would be good for me and I'm not alone. I remember a friend asked me onetime if I have spell checker, I said why of course. He replayed, do you us it! Thanks, now on twitter hope it goes viral. The RAD readings for Beta and Gamma he is reporting on are from the EPA RADNet or from independent stations? 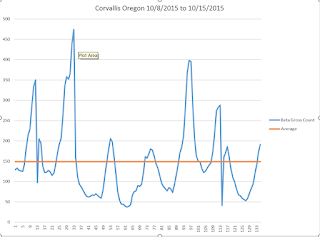 How credible is his data then if the EPA sensors are not working, o so they say? Thank you in advance. I did an article on that, use the search box "Veterans"
He is doing some alarmist reporting that is incorrect. "Moving the mobile lab and dropping the milk monitoring are 'part of a pattern of retreat' by the EPA on its radiation-protection work, said Jeff Ruch, executive director of Public Employees for Environmental Responsibility, a Washington, D.C.-based advocacy group." I am getting distraught right now,. Call the EPA director. His number is right in the article, let me know if you do, Hotaters did. Calls get their attention. "Officials blame electromagnetic interference from sources such as cellphone towers"
these smart meters are all across the country , i wonder if they set the EMF so it would have the greatest impact on the rad net. Not saying they did , just saying they could. Ya, we have way to many sources of electromagnetic radiation.